Since Restrict Content Pro 2.5, members can easily upgrade between membership levels at anytime by visiting their account page. 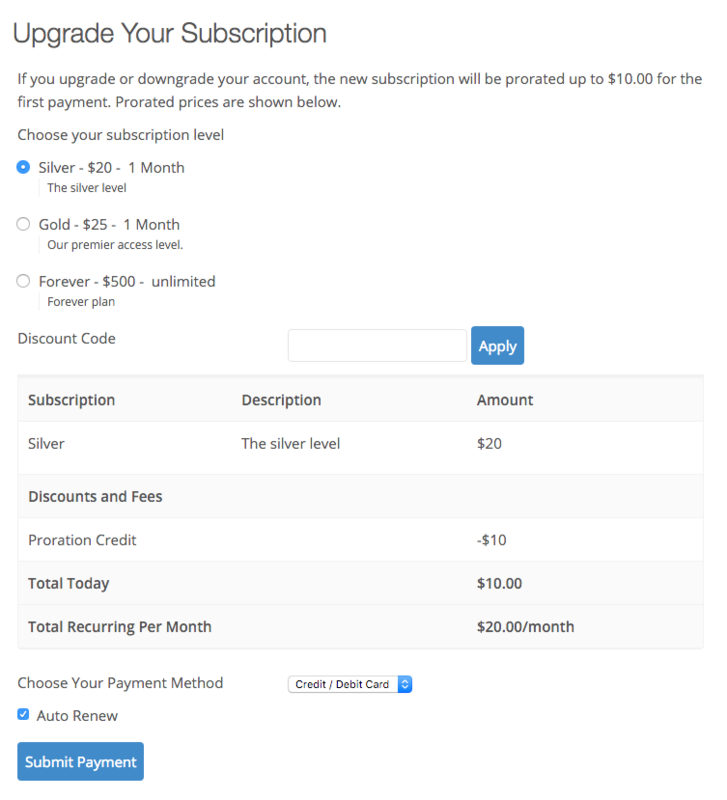 When upgrading a subscription, the members purchase will be prorated based on the amount they have already paid and how long is left in their current membership. Clicking the Upgrade or change your membership link will take the member to the registration page where they will be shown a list of available options. If there is a proration credit available, it will be shown. For example, in the screenshot below, the member purchased a $10 monthly membership and then, on the same day, chose to upgrade to a $20 per month membership. As they had already paid $10 for the first month, the new purchase is discounted by $10. The proration credit is calculated automatically based on the member's last payment record and the length of time left on their current membership. What if I do not want accounts to be prorated? If you are unsure of how to create a custom plugin or add the code snippet to your site, read our documentation article. What if I do not want members to be able to upgrade their memberships? When using PayPal Standard, it is required that you enter your PayPal API keys in Restrict > Settings > Payments in order for subscription level upgrades to function properly.